RoadTrailRun was offered the opportunity to review poles from two different companies, Komperdell and Leki. We could have done an apples to apples comparison of their most similar poles, but we ultimately decided that it would be more interesting to review different poles, with some overlap, but designed for slightly different usage. Why poles for running? I have often wondered the same thing, as I had never used them for anything outside of skiing or snowshoe hiking. It is claimed that, when used properly, poles can aid in efficiency, relieve stress on your core and provide balance and stability. Do they really make a difference? With huge advancements in carbon fiber engineering and overall design, poles have become incredibly lightweight, fold quite compact and are easily accommodated on the majority of running vests/packs. Wildly popular in Europe, they have been slow to catch on here in the US. I am not entirely sure why, but if I had to guess, would say that it may have to do with tradition, combined with our more manicured, lesser gradient trails, vs. the steep, no nonsense, (what the heck is a switchback?) trails more often found in Europe. I find myself a bit torn on the benefits of poles, at least preferential as to when and where it works best for me to use them. On steeper, loose terrain, scree, snow, sidehilling, snowshoeing or any scenarios where an extra point of contact might be needed, I find poles to be helpful. With a little practice, I find poles to aid in efficiency ascending steep terrain, where I may otherwise be leaned over with my hands on my knees. My back is a little more relaxed and less strained which is a clear advantage on long climbs and certainly on long days with lots of climbing. For actual running at faster paces however, I found myself carrying them almost always, or stowing them on my pack. I also found that using/carrying poles interferes with simple tasks much more than I realized. Of course eating and drinking come to mind, but then all the little things, messing with the watch, adjusting clothing, snot rockets, cleaning glasses, taking a picture on the move, etc..., the poles were a factor. Ultimately, it comes down to personal preference and I find having a high quality set of poles in the arsenal to be an asset depending on the day. 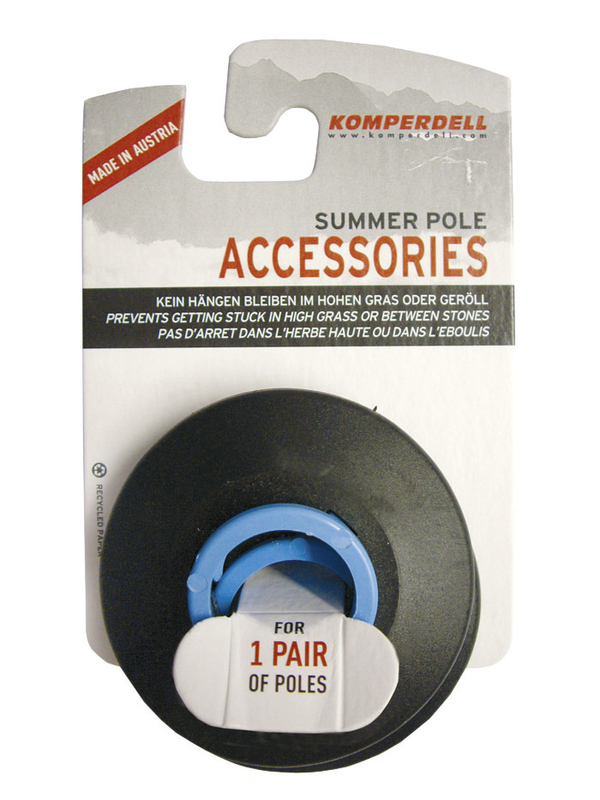 Komperdell is an Austrian company focused on poles for all mountain activities as well protective gear for skiing, mountain biking, equestrian, and motorcycling. I selected the Carbon Ultralite Vario 4 Compact specifically to use as an all season pole, with the larger ice flex basket making it suitable for snowshoeing or backcountry skiing, yet is light enough and folds compact for multi season running. Though initially I was somewhat indifferent on the ability to adjust the length of a pole, I found this to be a key feature. Being able to quickly and easily vary the length made for more efficient and effective use of poles. Personally, when encountering a steep and sustained climb, I found it most beneficial to drop the length of the pole from my normally preferred 120cm down to 115cm, where I could really take advantage of the added propulsion of using my arms. I am also amazed at how much it relieved my core and especially my lower back. On steep, loose, tricky downhills, I choose to lengthen the poles to 125cm and keep them out in front of me for added balance and stability. I felt a little more confident leaning slightly more forward where I could maintain my center of balance and reduce the chances of my feet slipping out. Varying the length on sustained and loose sidehills is quite handy as well, lengthening the downhill pole and shortening the uphill pole. With the Ultralite Vario 4 Compact, it is super quick and easy to adjust while on the move. The Carbon Ultralite Vario 4 Compact is, although quite thin and light, extremely sturdy and well constructed, utilizing carbon fiber and aluminum for the main shaft. When compacted and folded, the Carbon Ultralite Vario 4 Compact is quite small and tidy (41cm), making it very convenient to lash to a pack or running vest, or even stuff inside a pack. The sections of shaft are threaded, which makes for a secure interface. The ice flex baskets tilt as necessary in order to accommodate varying terrain. The grips are made of a durable foam that are comfortable and are secure to grab onto with no slippage. The padded straps are comfortable, but I found the adjustment design to be unreliable, as the toothed wedge that secures the strap would sometimes get hopelessly stuck. It seems like a simple design and works well sometimes, but ~10% of the time the wedge would become hopelessly stuck. This became enough of a pain that I just quit adjusting them and now leave them semi loose all of the time and never mess with them. The adjustment latch is very easy to operate (with or without gloves) and quite secure. You can adjust the screw to dial in the tension of the latch. The tungsten/carbide tip seems to be quite durable and gets good traction on a variety of surfaces. 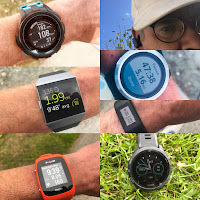 Overall, I found the Carbon Ultralite Vario 4 Compact to be a very lightweight, sturdy, high quality, easy to adjust pole that works very well for a wide variety of terrain, from steep dry trails and off trail, icy trails and for snowshoeing in varying snow conditions. These are amazing poles and I would highly recommend them, but would love to see a more easy to use and reliable strap system. One other minor complaint is that the threaded connections come lose fairly frequently when I tighten them just with a normal hand twist. The only way I could eliminate the possibility of them loosening was by using rubber garden gloves for increased grip when tightening. -.2 for price. Though very high quality, $239.99 is a lot of money for poles. Weight: 13 1/4oz./373grams per pair. Leki is all about poles for all sorts of mountain activities. Equipping many of the top alpine racers in the world including US Ski Team star Mikaela Shiffrin, their Trigger Shark grip is popular in biathlon where poles must be quickly removed during target shooting segments then re gripped to continue skiing. It is only natural that this technology along with super durable very light weight carbon construction has found its way into running and trekking poles such as the Micro Trail. The Leki Micro Trail also features very high quality, carbon construction, is light, easy to fold/unfold, easy to stow on a pack and has a very well thought out active grip system, called the Shark 2.0. To fold, simply press the button and the top 1/3 of the pole slides down, releasing tension to allow the other thirds of the pole to be detached. There is a sturdy tension cable within that is long enough when released for easy folding. Also a good view of the micro basket and carbide tip. Another view of the connection and tension cable. When folded, these poles seem improbably compact. The Shark 2.0 active grip and strap system was for me one of the highlights of the Micro Trail This system relys on a trigger at the top of the pole that is easy to reach with your thumb, which releases the loop that is attached to either the supplied strap, or a variety of gloves (sold separately). I found it particularly handy when I wanted to quickly release to free up a hand or both hands for any reason. This system is remarkably reliable and easy to use. I am not sure why all poles don't have something similar, as it makes a huge difference. Leki was also kind enough to provide a bicycle style glove that is compatible with the Shark 2.0 system. Warmer, more insulated gloves that are also compatible with the Shark 2.0 system are available, or you can easily fit almost any glove into the supplied strap. Video demonstration of the Trigger Shark Active strap, Shark 2.0 Trigger system, and rapid folding and unfolding of the Micro Trail. The micro sized basket does very little. Not for use in deep snow and care must be taken in talus. A handy storage bag is provided as well. Stowing on a running vest is a snap. I really enjoy using the Micro Trail in situations where I want a lighter pole, will not be in deep snow or talus and might want the added convenience of stowing on the pack, which is much easier with the quick release folding mechanism and slim grip/basket more easily fits on a wider variety of vests and packs. Not to mention, the convenience of the Shark 2.0 grip system is tough to beat. The Micro Trail is sturdy and secure, well build and has excellent build quality. The cork grip is a nice touch and the attention to detail is impressive. My only regret is that I did not get the Vario version. I have always used a fixed 120cm pole for skiing and snowshoeing and never really thought I needed the option to adjust, but after going back and forth between the fixed 120cm length of the Leki Micro Trail vs. the Komperdell Carbon Ultralite Vario 4 Compact, I have come to appreciate the variability on different angle terrain. -0.1 for weight. Though incredibly light, there are still lighter poles on the market. A very minor deduction though, as the added weight may just worth it for the supreme quality and convenience of the Shark 2.0 grip system. For racing, 3 season use, simplicity, compactness and convenience, it is hard to beat the Leki Micro Trail. They are sturdy, fold fast, store easily, are ridiculously compact when folded and most easily are accommodated by a wide variety of packs/running vests with pole loops. Not to mention, the Shark 2.0 system is really an advantage. For greater versatility and a wider range of use, I would certainly suggest the Komperdell Carbon Ultralite Vario 4 Compact. They are light enough for running/racing, can be used in snow with the larger basket and adjust quite easily for varied terrain. For backpacking, backcountry skiing, rough hiking or if you are a heavier person who is rough on gear and are not so worried about having the lightest, most stowable poles, consider dual flick lock trekking poles, such as the Black Diamond Alpine Carbon Cork (not reviewed here, but we tried!). The poles in this review were provided at no charge. The opinions herein are entirely the author's. 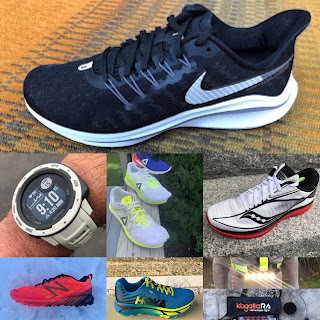 Click Here for Latest Running Shoe and Gear Reviews, over 65 in 2016, 20 in 2017 so far! Click Here for 2017 Run Shoe Previews, 14 brands so far!